At least twenty people have been killed during a football match in Ivory Coast. The crush happened at the start of Ivory Coast's world cup qualifying match with Malawi as tens of thousands of people tried to get into the stadium. . It seems many fans - some who had tickets but many without - were angry when the stadium gates were shut. Police tried to keep the crowds back with tear gas , but in the panic the supporters were crushed against a wall and struggled to escape to safety. The Ivorian Sports minister, Dagobert Banzio, says there seemed to be more people outside the stadium than in it. Banzio: 'Some spectators who didn't have tickets tried to force their way in . Unfortunately they broke down one of the big gates and in the stampede people were crushed'. Those people are now being dealt with in the city's hospitals. The government is promising an inquiry into what went wrong. Africa is no stranger to these kinds of incidents, but this is one of the most serious for several years. The national football association had told those without tickets to stay away, but thousands ignored that message hoping to see Ivory Coast's Europe-based football stars. The big attraction was local hero Didier Drogba who missed the previous round of qualifiers due to injury. 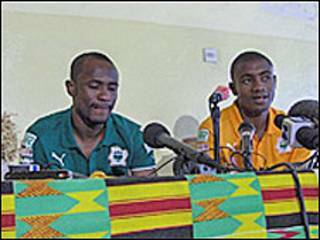 He scored two goals in the five-nil Ivorian victory, but that has now been overshadowed by what happened off the pitch. John James, BBC News, San Pedro.